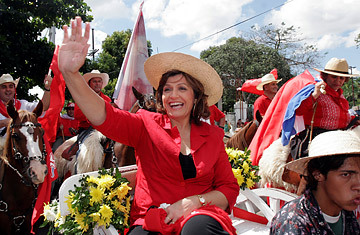 Blanca Ovelar, Paraguay's presidential candidate for the Colorado party, greets supporters from a horse cart during the "Caballeria Colorada" rally in Asuncion, April 12, 2008. For most of its history, Paraguay has been almost a caricature of the right-wing South American military republic. Its infamous 19th-century dictator, General Francisco Solano Lopez had his own mother flogged in public and then made the nation's Roman Catholic bishops declare him a saint; its equally villainous 20th-century tyrant, General Alfredo Stroessner, turned the country into a haven for Nazi war criminals. Ever since, Paraguay has struggled to be seen as something more than a benighted agricultural backwater wedged between Brazil and Argentina. Which is why this Sunday's presidential election promises to be such an important turning point for Paraguay  and one that holds significance for the rest of South America. The front-runner is a former Catholic bishop, Fernando Lugo, a liberal whose base is the poor rural heartland, where he is popular for his work with landless peasants. If elected, Lugo would be the first former Catholic bishop ever to become President of a nation. He has also pledged to tear up electricity price contracts with neighbors like Brazil, deals that he charges cheat Paraguay out of hundreds of millions of dollars in sales of its vast surplus power. "Our victory will mark a historic break with the past," says Lugo's campaign manager, Miguel Lopez. "A spontaneous, popular movement taking power in Paraguay. It's incredible!" In a recent speech, Lugo, 57, who leads most voter polls with as much as 39% approval, promised that "Paraguay will not continue to be an island separated from the rest of this great continent." If Lugo is Paraguay's first former cleric to be a presidential candidate, his closest contender is the first woman: Blanca Ovelar of the conservative Colorado Party, which has ruled the nation of 6.5 million people for the past 61 years, the longest period of any party currently in power anywhere in the world. A win by Ovelar, who is polling up to 34%, would follow a regional trend set by the 2006 election of Chile's first female President, Michelle Bachelet, and that of President Cristina Fernandez last year in Argentina. The bearded, bespectacled Lugo stunned Paraguay and angered the Vatican in 2006 when he renounced the priesthood to enter politics. He went on to spearhead an uneasy alliance of Liberals, socialists and workers' movements that have long opposed Colorado hegemony. His policies remain vague, and his critics warn that he would simply be a Paraguayan version of radical leftists like Venezuelan President Hugo Chavez and Bolivian President Evo Morales. But Lugo's running mate is a free-market liberal, Federico Franco, a Morales critic. On the campaign trail, Lugo has criticized Chavez for polarizing Venezuelan society and urges greater political openness in Cuba. Though his rhetoric often echoes the leftist cant of Latin America's liberation theology, he insists his agenda is social, not ideological. "I come from an ecclesiastical formation," Lugo said recently. "There is an option of the Latin American church and it's the most preferred option among the poor." That message plays well in a country where, according to the United Nations, 21% of the people live in extreme poverty  and the figure is rising  making it South America's second-poorest nation behind Bolivia. (Per capital gross domestic product is little more than $4,000 a year.) It is also one of the hemisphere's most corrupt, which Colorado critics blame on so many years of one-party rule  35 of those under the brutal and venal Stroessner until his 1989 overthrow. Paraguay's government has been civilian since 1993; but a recent survey found that more than a third of voters regard public corruption as the country's most pressing problem. One result: about a fifth of the population has emigrated to countries like Spain and Argentina. Lugo sees the electricity deals as one solution. Rising demand has created an energy crisis in South America, especially in growing economies like Brazil; and Paraguay's hydro-electric dams on the Parana River provide one of the nation's most valuable commodities (and almost two-thirds of its GDP). The market value of the electricity Paraguay sells to Brazil and Argentina each year is estimated to be more than $3 billion; but Paraguay receives less than $1 billion for it. Lugo wants to renegotiate that arrangement, and many if not most Paraguayans back him. "We've been robbed by our neighbors for far too long," says Luisa Guillen, a market stall owner in the capital, Asuncion. "It's time Paraguay stood up for itself, and I think Lugo's the only candidate who realizes that." So far the election campaign has been dirty, and the streets of Asuncion are plastered with lurid propaganda. One poster depicts the Colorados as a plague of mosquitoes that need eradicating, while another portrays Lugo as the Antichrist with devil's horns and a pitchfork. Lugo's campaign has accused the Colorados of tampering with ballots  and campaign manager Lopez says he fully expects Lugo to lose "between 70,000 and 100,000 votes" to fraud. Newspapers, for example, have published the names of long-dead Paraguayans who are still registered to vote, and international observers have warned of a "tense electoral climate." Ironically, one of Lugo's largest blocs of opponents is Catholic churchgoers who feel betrayed by his renunciation of his priestly vows. "If Lugo can lie to the Pope, he can lie to anyone," says Lino Oviedo, a former army general who is running a close third in polls  and is running only because the Supreme Court last year overturned his conviction for allegedly leading a 1996 coup attempt. Says Felipe Lopez, 49, an unemployed laborer who plans to vote for Oviedo, "Lugo was a man of the church and he gave it all up for what? For ambition." Unusually for Latin America, a candidate can win the election with a simple plurality. (Most Latin countries hold run-offs if no candidate receives a majority.) The winner won't take office until August 15, leaving plenty of time for electoral skullduggery, legal challenges and the dissolution of alliances. For her part, Ovelar promises the Colorado Party will concede defeat, "even if it's only by one vote," and peacefully hand over power. But in the 197 years since it won independence from Spain, Paraguay has never once witnessed a peaceful transfer of power from government to opposition, and many remain unconvinced. If Lugo does win, Paraguay will at least have the distinction of moving from a country whose dictator once made himself a saint to one whose bishop got elected President.